Syfy has confirmed in a statement to Deadline that they have passed on taking Ascension to series. But what is more interesting is what they said…”We were very happy with Ascension as an event series, but with so much high profile development in the works, we have decided not to pursue a full series,” according to the statement. What that tells me is that although Ascension did well, Syfy believes that what they have in the pipeline is likely stronger. While there is some slight hope it could get picked up by another network, the odds are very slim…network hopping is pretty rare as another network is unlikely to be able to make a show work any better than it did on the previous network to risk it. Syfy has not confirmed publicly or responded to requests on this, but actor Gil Bellows said in a tweet this weekend that Syfy has not picked up Ascension for any sort of continuation of the story. Syfy is likely silent as the show is currently airing in Canada, and wouldn’t want to potentially torpedo the ratings. 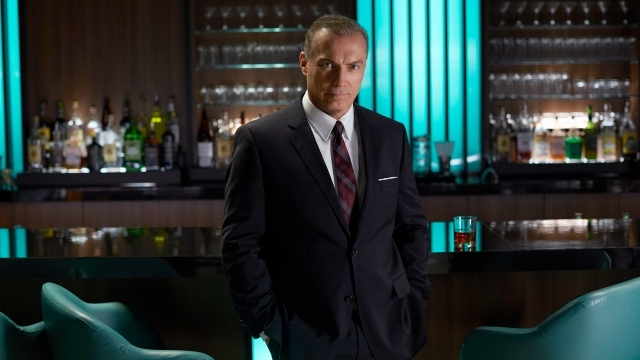 In our earlier article where we talked with Al Sapienza, who plays Councilman Rose on Ascension, I mentioned that I couldn’t tell you everything that was said, as we had both seen the first night of the show already and the “big reveal” at the end. What follows is the remaining part of that conversation. So if you HAVEN’T SEEN the first night yet, bookmark this article and come back after you have seen it. I REALLY don’t want to spoil it for you. Really. I mean that. Do not read another word until you’ve seen it. Ascension concludes tonight at 9/8c on Syfy, so here is a little preview, along with interviews with Tricia Helfer, Gil Bellows and Andrea Roth! 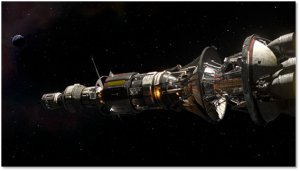 Syfy’s limited event series Ascension soared during its first night premiere, taking 1.8 million viewers aboard ship including 882K Adults 25-54 and 772 Adults 18-49 on Monday, December 15 from 9-10:25PM (ET/PT). Syfy boasts three of the top 10 ad supported cable scripted series launches among Adults 25-54 this year – Ascension, Dominion and Helix. Socially, Ascension achieved Syfy’s highest number of tweets for a scripted series premiere behind only the 2013 season one debut of Defiance. Ascension continues Tuesday, December 16 and Wednesday, December 17, both nights at 9PM (ET/PT). Ascension is an ambitious original drama following a covert U.S. space mission launched in the 1960s that sent 600 men, women and children on a century-long voyage aboard the starship Ascension to populate a new world. Halfway into their journey, as they approach the point of no return, the mysterious murder of a young woman causes the ship’s population to question the true nature of their mission. Ascension also stars Al Sapienza as Councilman Rose, Tiffany Lonsdale as Chief Astronomer Emily Vanderhaus, Andrea Roth as the ship’s head doctor Juliet Bryce, Jacqueline Byers as her daughter Nora Bryce, PJ Boudousque as Nora’s love interest James Toback, Ryan Robbins as Safety Officer (and Emily’s husband) Duke Vanderhaus and Gil Bellows as Harris Enzmann, the son of the Ascension mission’s founder. Ascension is created by executive producer and showrunner Philip Levens (Smallville) and executive produced by Jason Blum (The Normal Heart, Stranded, The River, film franchises Paranormal Activity and The Purge) along with Ivan Fecan, Tim Gamble and Brett Burlock on behalf of Sea To Sky Studios. The event series will be co-financed and distributed by Universal Cable Productions and Lionsgate Television. Tonight’s the night! Syfy’s event series starts tonight at 9/8c, with parts 2 and 3 airing tomorrow and Wednesday night! Keep in mind, the end of tonight’s showing contains a MAJOR SPOILER for those who haven’t yet watched it, like all those on the left coast – so PLEASE be careful on social media! I met Al Sapienza, who plays Councilman Rose on the upcoming Syfy event series Ascension which debuts next Monday night at 9/8c, in October with the rest of the cast (check out our previous article on the show and cast discussion), and then had a one on one discussion with him recently to talk about the upcoming series. Rose is the head politician of the show. On the face of it, he’s second only to the Captain, played by Brian Van Holt, who is still an elected official but is ultimately in charge, followed by a council – something similar to a city’s mayor and council. But Rose has eyes on the Captain’s uniform – as well as for the Captain’s wife (played by Battlestar Galactica‘s Tricia Helfer). Al’s a busy guy too…he recently appeared in a recurring role as a detective in Person of Interest, he played Mikey in The Sopranos, and many many guest roles. IMDB lists 24 future roles as well! Doc: One thing you said [during the press panel] that I thought was very interesting was that when researching the role, as opposed to trying to learn a new role, one thing you have to do in this show is you actually have to forget everything you do know. It’s just a few weeks away – Syfy’s three night event series (and backdoor pilot) Ascension starts Wednesday, December 15th. Check out this first look at life aboard the U.S.S. Ascension and some behind the scenes featurettes! With Syfy’s renewed focus on the genre from which it was born, the upcoming event series Ascension leads the way on full thrust. The concept is interesting – part science fiction, part period drama, part murder mystery. At the height of tensions between the United States and the Soviet Union, in order to unsure that the Human race will survive, in 1963 the U.S. launches the U.S.S. Ascension, a secret mission to launch humanity to the stars. Carrying 600 men, women and children, the Ascension is 50 years in to their multi-generational mission and approaching the point of no return, when the first ever murder takes place on board. With no way to get advice back from Earth and no one trained in murder investigations, a web of intrigue and secrets might get unraveled and reveal the true secrets about the Ascension. One of the intriguing parts of the show is going to be at the society level. If you took 600 people from 1963 – before women’s liberation, the Civil Rights movement, technological advancements, modern terrorism, and all the other things shaping our society, and placed them in a town with no outside influence but with the technology and a library of written knowledge and entertainment available at the time. Place a fixed restriction on resources, which would necessitate a strict limitation on population – forced birth control (something that was even more controversial back then), birth rights, etc. What would happen over time? Ascension, Syfy’s upcoming event series, will air on three consecutive nights in December, starting on Monday, December 15th, at 9/8c.